Hundreds of thousands of United States government employees are now back at work, after President Obama signed a new law ending the government shutdown and extending the much-discussed US debt limit. The cross-party deal, which came just hours before the US government risked defaulting on its loans, raises the$16.7tn debt limit – funding the government to 15 January and extending the US Treasury departments’ borrowing authority until 7 February. Whilst the deal does prevent a catastrophic US default in the short-term, it doesn’t resolve the budgetary issues that have so strongly divided Democrats and Republicans. Instead, it has established a committee of legislators from both parties that will now need to craft a more long-term budget deal – reporting back to Congress by the middle of December. 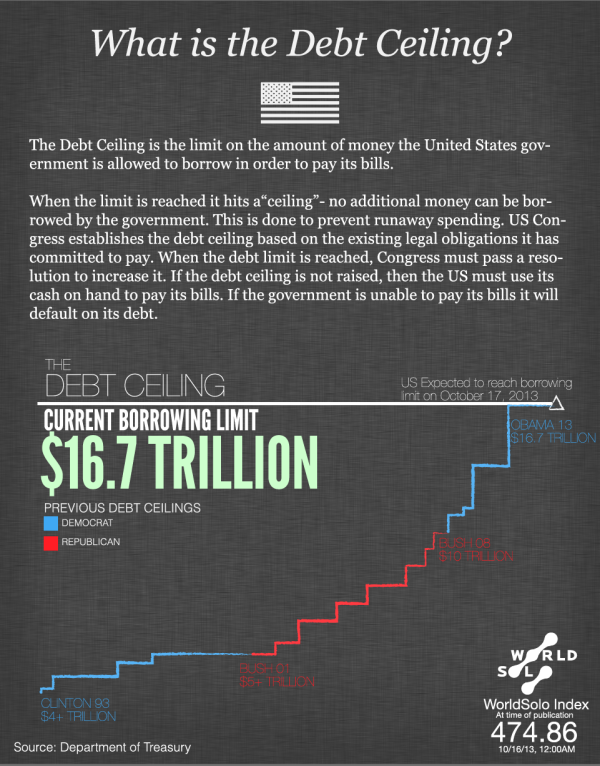 The debt ceiling is the limit on the amount of money the United States government is allowed to borrow in order to pay its bills. When this limit is reached it hits a ‘ceiling’, meaning no additional money can be borrowed by the government. When the limit is reach, Congress must pass a resolution to increase it, or use its existing finances in order to pay its bills. If the government cannot pay these bills and a resolution to raise the limit is not established, the US will default on its debts.